Saturday night the girls went out to celebrate Gigi’s birthday, which was on the 12th. Momo, Sara, Gigi and I first went to dinner at Ruby Tuesday. We always go to the Ruby Tuesday where Momo works because we know we’ll get great service and Ruby Tuesday is Gigi’s favorite restaurant. We all had broccoli as a side dish and that night it was terribly over cooked. Normally it is fantastic there and perfectly cooked. While Momo was in the restroom Sara and I piled all our broccoli on to Momo’s plate. When Momo came back she did a double take at the giant pile of broccoli. Sara had the giggles so bad she literally did a spit take! Out came Sara’s chicken and mashed potatoes! So funny! After dinner we went to see It’s Complicated. Such a cute movie- way funnier than I thought it would be. The entire theatre was cracking up through the whole thing. We had a lot of fun. Yesterday was Joey’s 5th birthday. Uncle CSP had the day off so he was able to attend the party with me. 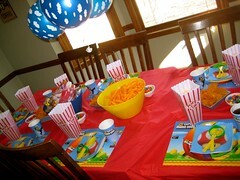 Marc & Sara had a birthday party for Joey at their house. The theme- Mario. Like Super Mario. 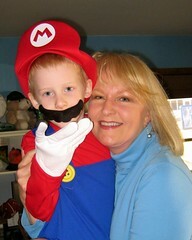 We arrived to find Joey all dressed up as Mario! SO cute! Here he is with Gigi. A few of Joey’s friends from preschool came and Sara had asked me to do some face painting since kids that age love it. The line quickly formed and the kids had a great time. 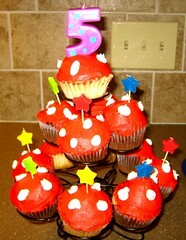 Sara had the kitchen all decked out in the Mario theme and there were even little mushroom cupcakes! 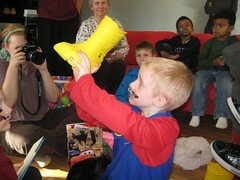 Joey loved his Crocs snow boots we got him! I just realized I didn’t take a picture of the cute Crocs Blitzen shoes we got him. Boo! I found Mario Jibbitz for them too. Well, take my word for it, they are too cute. More pics here. Someone else had a birthday yesterday….Molly! 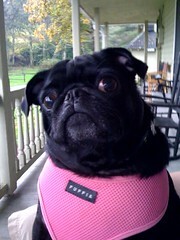 Our sweet middle child Molly turned 4! No fanfare for her since Joey’s birthday is on the same day. She doesn’t mind though. We gave her a new booda bone and she went to town. Next Saturday is Olivia’s birthday party and CSP’s dad’s birthday. All these January birthdays!